This CowboyStudio M1 2-in-1 Photography Boom Light Stand kit is an amazing value. 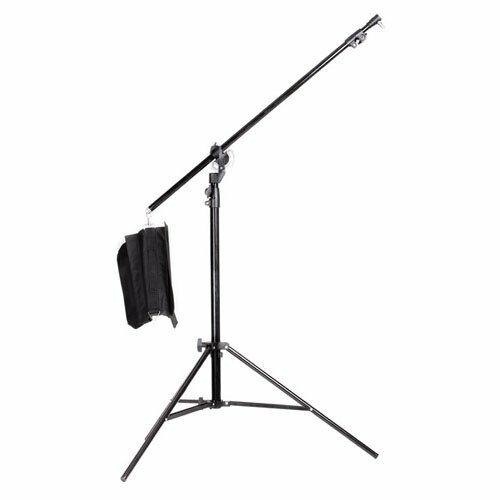 Easily use it as a heavy duty 13 foot light stand or it converts in seconds to a Boom Arm Light Stand, capable of easily supporting a 12 pound load overhead. Comes with sandbag. *The Horseshoe style quick release lock on this item makes angle adjustment on this boom super quick and easy. *As one of the taller booms we offer, this will allow you to get a good height on the item to allow a higher range of motion. *The hole on the end of the boom arm will allow you to attach your own counter weight to the item, giving you flexibility in the weight system used. *The thread for the boom reverses between 3/8 and 1/4 threading and can attach either in the standard parallel fashion or sticking to the side perpendicular to the item.